05.11.13 What is it like here in Kabetogama, MN? 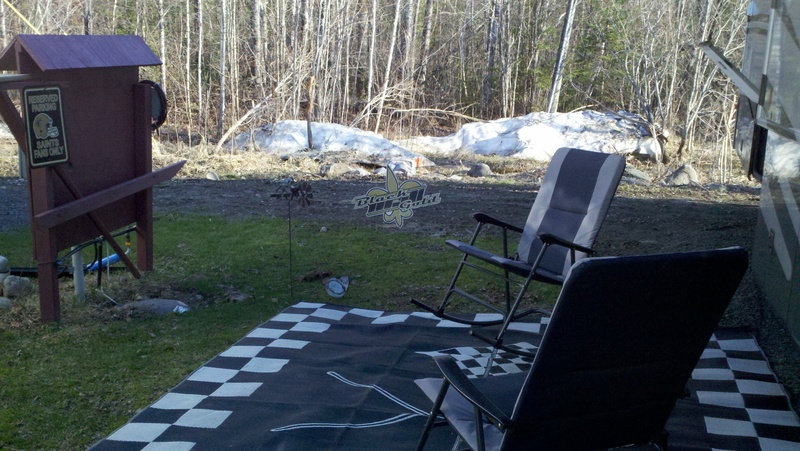 Our little patio outside our RV with our rockers and Saints signs! 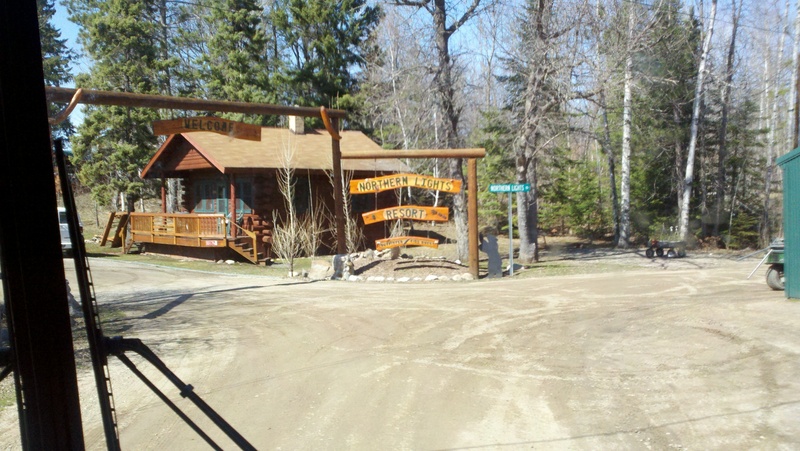 We are settling in at Northern Lights Resort & Outfitters and have much to learn about this workamping lifestyle. The trip in was really nice. Once we got to Minnesota things seemed to get prettier without all the farmlands we saw going through North and South Dakota. Every inch of the land along side the interstates or highways was all farmland and lots of Christmas tree like trees. Everyone seemed to have several of those trees either in a bunch or in lining their driveway or property line. They were the only green we saw heading up north. The speed limit on the interstate was 75 instead of 70 like in the south. Here in Minnesota there are these Christmas trees everywhere and it’s just beautiful. The ones here look like the ones you’d see on the White House lawn at Christmas. There are lots of other trees here but they all look dead. Just like our trees did about two months ago in Louisiana before the leaves started coming out. They will be beautiful and lush once they are in full bloom. When we drove in Roy expertly parked Dora in her new home spot in between the other workampers homes. We met Debbie and Rick Long, the resort managers, and Jim, Beth, Russ and Annie the other workampers. This is Rick, Debbie, Jim and Beth’s second summer here but Russ and Annie are new here, like us. We also met the resort owners Tom and Pat who were very welcoming. They were all working very hard getting everything ready but stopped for a bit to welcome us and then let us get settled for the night. It is very nice to know we are parked where we will stay for the next several months. Moving from town to town every day or every other day got old real quick. Too much to do to leave and arrive. Once you get settled it’s time to go. I think this stay a while option is the one we’ll be aiming for. We are parked near the lodge and the lake and have made our little spot home with our rockers, floor mat, Saints signs and a couple of yard ornaments from our garden at home. 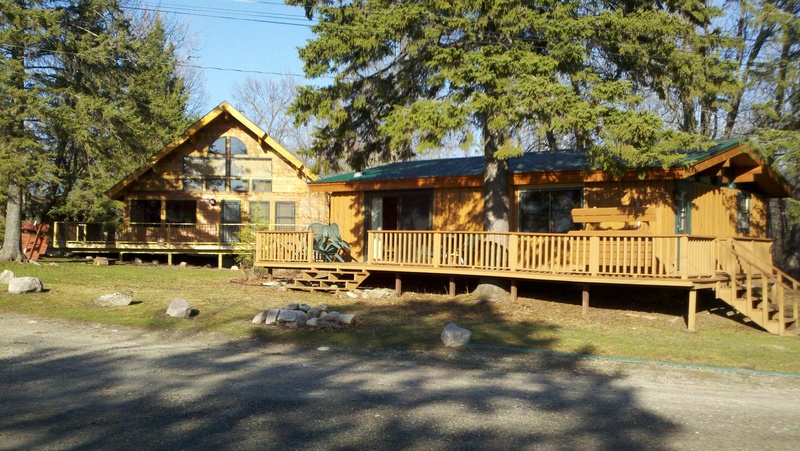 Two of the cabins, there are over 10 spread out throughout the resort. Debbie and Rick gave us a tour of each of the cabins and the lodge our second day here. There are different size cabins with the biggest accommodating 16 guests. Each is beautifully decorated in true woodsy cabin style. We stayed in a cabin in Tennessee a couple of years ago and that one holds nothing to the decoration and warmth in these cabins. When we start working on Monday we’ll join the work that the other workampers have been doing the last week or two. The women have been going through each cabin thoroughly deep cleaning and getting everything ready for guests. Before leaving last Winter they winterized the cabins and put everything in plastic bags and took other precautions so they’d be okay through the winter. Now they are undoing all that and getting them all sparkly clean. The men have been painting, repairing or replacing things that need it. There are critters that sometime met their fate in the toilets and the guys take care of that before the women even have a chance to scream about it! They just got water a few days ago and the snow/ice hasn’t left the area when it normally does so the outside work has been delayed because of that. I think it looks great as it is but I’m sure once the grounds are manicured and flowers are planted it will be guest ready! Roy’s been assigned to cut the grass next week and probably replace a ceramic floor and I”ll be joining the women in cleaning the cabins. When they say clean the cabins top to bottom they really mean it. I’ve heard we even get to get on tall ladders to clean the rafters. If ya’ll hear a loud scream coming from up north you’ll know that’s where I am! We enjoyed homemade chili yesterday evening with the other workampers and the resort managers. Debbie cooked the chili which I do believe rivals mine for deliciousness and Beth made a peanut butter pie that was scrumptious. We ate in the lodge which is a beautiful big room with ping pong table, foose ball table, huge rock fireplace with a set of moose antlers above it. The other wall has a full moose’s head and antlers on it. I’m thinking all our hunting friends would just love it here. There are a couple of sofas around a huge round table made from a varnished slice of a 100 year old tree on a tree trunk pedastal. There are hundreds of DVDs the guests can take back to their cabin to watch and a bookcase full of books for their reading pleasure. The ladies had cleaned the lodge and the men put a fresh coat of paint on the walls in the last few days so we got to enjoy it all freshly done. The resort store is attached to the lodge where they sell beautiful sweatshirts, teeshirts, condiments, ice cream and lots of other things. Also connected to the lodge is where the fish are cleaned which I’m sure Roy will be spending a good bit of time doing once the season gets in full swing. Today is the actual opening of fishing season here. Since we don’t have fishing seasons in Louisiana, we just fish when the urge says to, this was new to us. 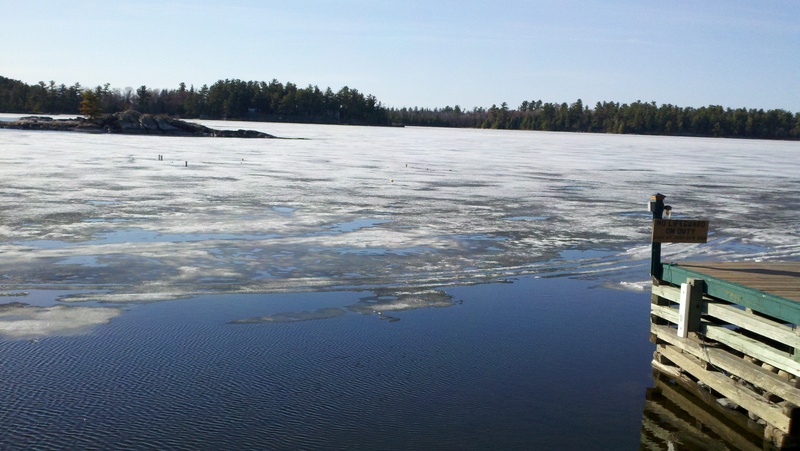 The lake is thawing pretty well around the edges but the center is still ice. 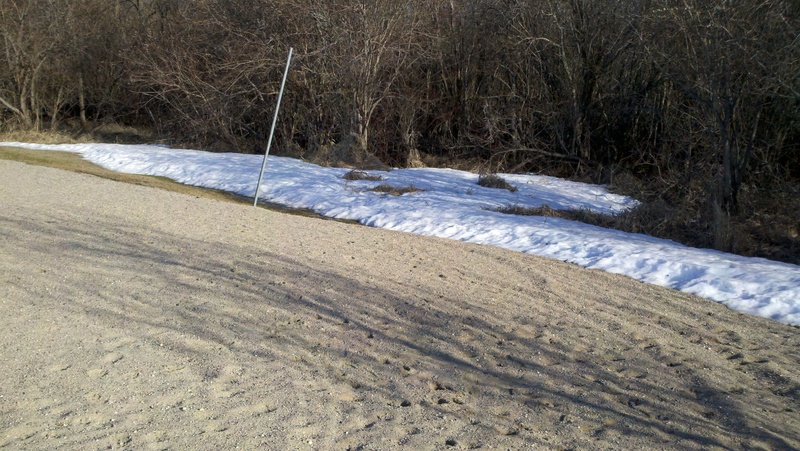 This isn’t a thin layer of ice like we’d get, it can get over 30 inches deep. The little ducks are swimming around in the thawed portion and enjoying it a lot! Our evening visiting with everyone was great and we got to know each of them a little bit. 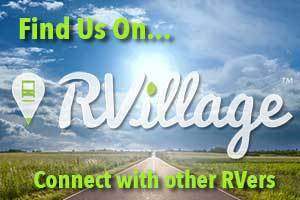 They are all pretty experienced RVers so we will probably be picking their brains for tips and advice when we can. I did ask each of them if they minded me including them in my blog and they all gave their okay. Of course what goes on at the resort stays at the resort so they’re pretty safe. Fireworks sold right in the middle of the grocery store! Roy and I went into International Falls, MN which is a gateway to Canada. It was around 35 minutes away. We went to Super One grocery and found the prices to be a bit high and it’s not a Walmart but it was a clean grocery and had everything we needed. We’ve been given a shelf in the maintenance room freezer to store our frozen things that don’t fit in the RV freezer. We stocked it up hoping it will last a good while before we need to go “back into town.” We even found some frozen crawfish tails for not much more than we’d have paid in Louisiana. Roy was pleased to find his Hellman’s Tartar Sauce which we usually can’t even find in Louisiana and they even have Louisiana Hot Sauce (which we stocked up on before leaving Louisiana just in case!) 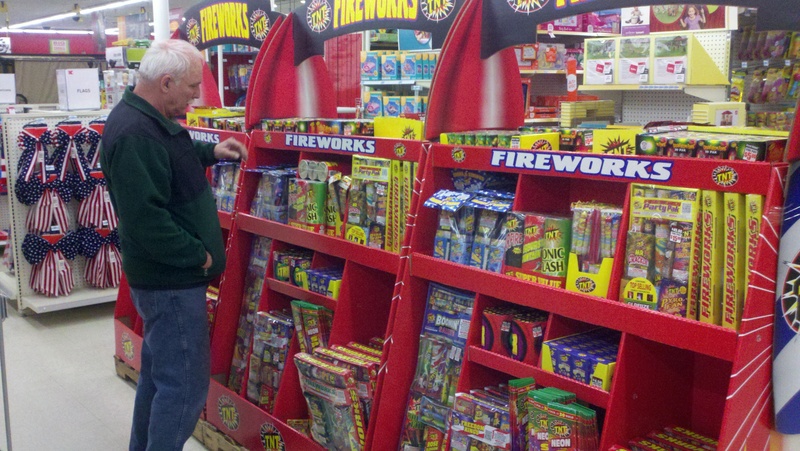 We did find something very odd in the middle of the grocery, they were selling fireworks. Can you imagine that? In the grocery! I had to take a picture of it. We learned very fast that there is only one spot on the resort where our Verizon cell phone service works. If we walk about 150 feet from the RV and stand on a rock next to a telephone pole you get sort of good service. But you can’t move or it starts fading. ATT works perfectly here which is so very different than in Louisiana. I was always so proud of how good our Verizon service was at home but not so much here. We were goinjg to suspend our Verizon service for the summer and get an ATT prepaid phone. We tried find that in International Falls today and it just didn’t happen. We even stopped at a Verizon store to see if there was anything they could do but no success there either. Since starting to write this Roy decided to look into buying an extender which allows us to pick up a Verizon signal and we can keep our phones. He ordered it today and it should be here on Tuesday or Wednesday. This way we don’t have to change our phone numbers but we’ll only be able to use the phone within 40 feet of Dora. At least it’s better than having to go our to the rock and hope for a signal!!! In an EMERGENCY we can be contacted through the Resort office number which is 218-875-2591. Please don’t call them unless it’s a true emergency, not just that you forgot my recipe for “Chicken Geraldine”. Got it? We’re planning to go to Kabetogama United Methodist Church tomorrow since it’s close to us. I’ve heard good things about them from the resort manager so we’re looking forward to Worshiping God tomorrow with them. We saw other churches farther off today and may attend those in future weeks. Only one Baptist church but we’re sure to visit there soon. 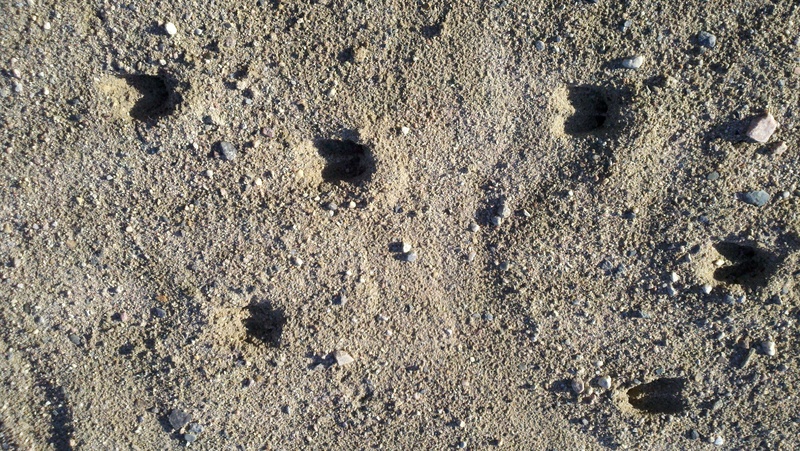 Deer hoof marks in the sand on the beach, so cool! We’ve seen two deer near the road already! We woke up this morning to snow and sleet. Their sleet is snow colored and not clear like ours is in Louisiana and of course it’s much more abundant here. I was also awakened to the fact that we only had power in part of the RV, random spots. Roy checked everything and got into all sorts of spots to try things out and nothing worked. He talked to the other guys here and even called Chip for some help from his technicians at Dixie RV. After a couple of hours of trying to figure it out and the temperature got down to about 54 in the RV and no TV or computer and Roy totally frustrated, he checked one more thing and that did the trick. A switch on the inverter was turned off. Even though we weren’t running on the inverter that switch turning off affected lots of things inside. Another RV lesson learned. Always check the inverter for power issues even if you’re not running on it the wind was blowing outside around 40 miles per hour which added to the freezing cold. They say it will get into the 80s next week and hopefully the trees will start to blossom soon and fill in the beauty of this place. 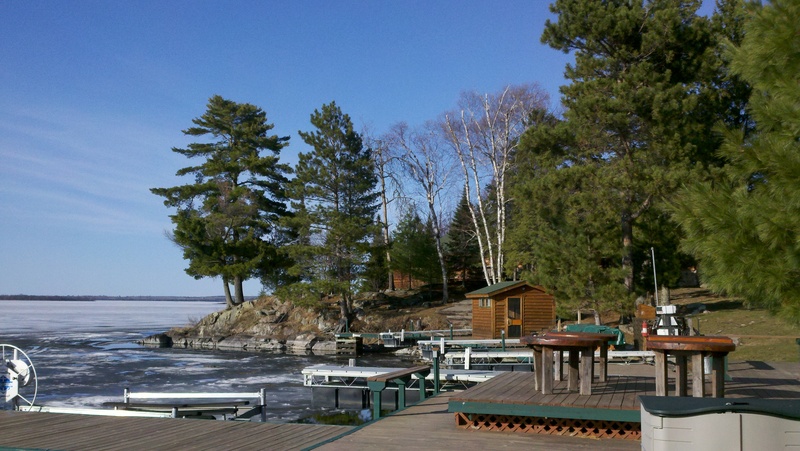 This is truly an honor to get to see this area of the USA and especially this resort and the beautiful Lake Kabetogama. Right now there is a hardened pile of snow next to the sand on the beach and it’s too cold to enjoy the beauty outside for any length of time. But give it a little while and I will be clicking away the camera trying to capture all this and share it with ya’ll! Our first guests at the Resort arrive next weekend and I’ve heard of so much needing to be done around here before then that I imagine we’ll all be working non-stop next week to make it happen. Always helps to a goal to work for! Don’t know how much time I’ll have for blogging next week but I’ll catch up when I can. I promise to take more pictures with my real camera after church tomorrow and will post them during the week when I can. I truly wish you all could be here in person to see the beauty that God has given to this amazing part of America. Ya’ll come back now ya’ hear! p.s. We had visitors to our blog from Japan, Philippines, Nigeria and Italy today! < 05.10.13 Why Mother’s Day is for the Birds, a link to a blog by Ann Voskamp. I am enjoying every blog you put out there. Stay safe and always in God’s hands.